Editor’s note: This is a sponsored post. The folks at WinterSilks recently asked me to choose a few pieces from their collection to review for Flattering50 readers. As the name suggests, WinterSilks features an extensive collection of natural silk dresses, silk cotton tops, silk wool sweaters, sleepwear and accessories designed especially to keep women warm in cooler weather. With the holidays just around the corner, two things are on my mind: 1) gift shopping for family and friends and 2) what I will wear for all the holiday festivities. I was thrilled to see that WinterSilks had both needs covered. According to website, the company's founder got the idea for WinterSilks after discovering the warmth and comfort of silk long johns. 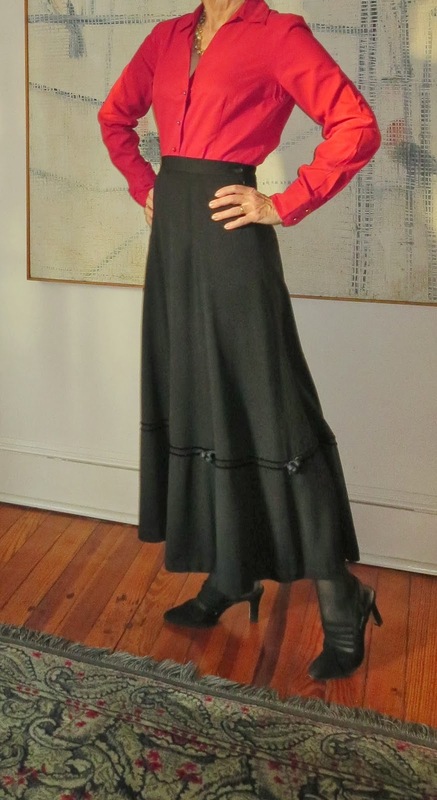 Over the past 30 years, the mail order and online boutique has grown to include apparel and accessories in a wide range of silks and other fabrics that offer comfort, natural warmth and easy styling--just what this woman over 50 is looking for! With so many great-looking fashions for women over 40, I had a hard time choosing what to review. I chose a Silk Cotton Cowl Hood, Silk Wool Glovelette, and Wrinkle-Resistant Solid Blouse. For additional information about these products, click on the photos. During the holiday season, I love to go into the city. The store windows are beautifully decorated and New Yorkers tend to be in fine holiday spirits. Since I do a lot of walking when I'm in town, I like to carry as little as possible. However, the fall/winter weather can be so changeable. A bright sunny day with a moderate temperature can turn into an evening with bitter winds blowing down the avenue. You have to be prepared for both possibilities. What I love about the WinterSilk Cowl Hood is that the single accessory takes care of both my neck and head in changeable weather. I can wear it as a cowl (below) to keep just my neck warm in moderate temperatures or as a hood (above) when I need head-to-shoulder coverage. The thick, silk wool ribbing is super warm and keeps the hood in place (but is still loose enough to minimize wretched hat hair). The back of my neck feels cozy and warm. In addition to Black, the hood is available in a Blare Red and Natural Color. The hood's high-quality and one-size-fits-all makes it a great gift idea. When I first saw the WinterSilk Silk Wool Glovelettes (above), I thought: “These might be a great gift for my nieces, especially the one living in New Hampshire.” However, then I read the description, which said they were “great for driving,” and I had a new thought: “Wait a second. I might like these.” This week, I wore the glovelettes several times in the car. The soft silk wool and cozy, sweater knit design offered just the right amount of warmth. The glovelettes were also long enough to prevent a skin-exposing gap between my coat sleeve and the glovelette. My fingers and wrists felt warm, but not too warm—like they do when I wear leather gloves in the car. With the cut-out fingers, I was able to grip the steering wheel and easily operate the different buttons on the wheel, like the Bluetooth and radio. Another great benefit: I can keep the glovelettes on when I run into the store for milk or to pick up the dry cleaning. There's no need to take them off to look through my wallet or sign a receipt. I don’t want to tell you how many pairs of mittens and gloves I’ve left on the store counter or the seat on a train. Needless to say, the glovelettes are staying with me. Fortunately, there’s plenty of time to order more for the nieces. The glovelettes are available in Brown Sable and Black. I love all the get-togethers with family and friends during the holiday season. However, putting together party outfits for all celebrations can be--gulp--challenging. A dressy blouse that mixes well with different skirts and dress slacks can be a lifesaver at this time of year. 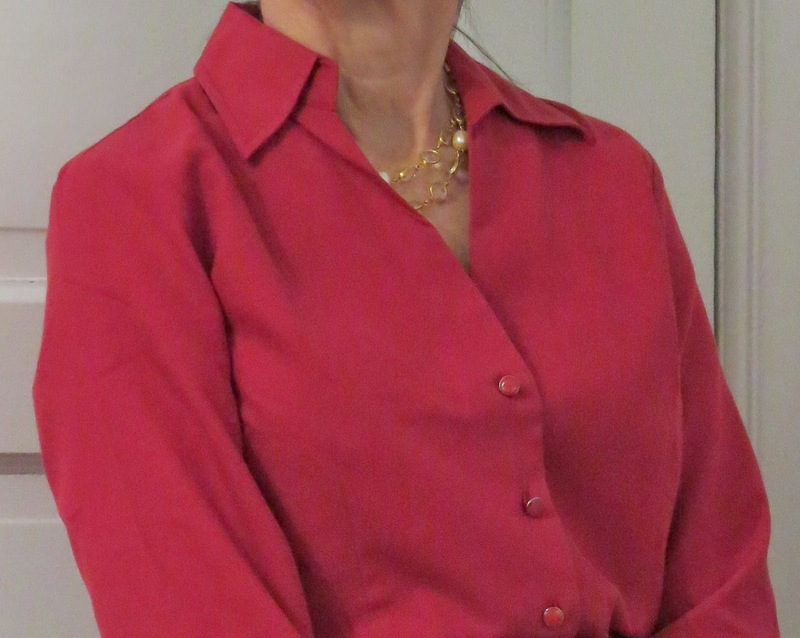 That's what attracted me to the WinterSilk Wrinkle-Resistant Solid Blouse (below). The blouse in Rumba Red just shouted "Happy Holidays!" to me. Based on the site's description and photo, I was hoping the blouse’s silk cotton material would be soft and rich feeling. I'm happy to report that it is! It is also nicely-constructed with a flattering V-neckline, feminine darts and dyed-to-match enamel buttons. For this post, I’ve styled the blouse with a black twirling skirt. (My style inspiration came from Oprah, who modeled a white collared dress blouse and black long skirt on a recent cover of O magazine.) I plan to wear it with my short black lace skirt as well. In fact, I suspect I will be wearing it a lot in the next month. Thank goodness it’s wrinkle resistant because who has time to fuss at this busy time of year? The blouse is also available in white and Deep Fuchsia (another smashing holiday hue) and white.